As part of The Schoolhouse Review Crew, I received the Costumes with Character eBook from Golden Prairie Press to review. Make Your Own Costumes from Eleven Time Periods with One Dress! Costumes with Character is written by Amy Puetz. With a foreword by Jennie Chancey. 72 full color pages available as an ebook or printed book. View the table of contents and sample pages There are many pictures of the different costumes on the website. Amy Puetz is a homeschool graduate who loves history. She loves to tell the stories of people who impacted their generation. Using costumes is a great way to make history come alive for kids and reinforce what they are learning. This easy sewing book has step by step instructions and patterns for making all the accessories needed for eleven different time periods. I really love that you can use one dress for all 11 time periods. Simply change the collar and cuffs. Then add the accessories like bonnets, vests, aprons to achieve the different looks. Patterns are included for all. The patterns are designed for young adults but a handy adjustment formula is included to help you use the patterns for younger girls. The patterns in the book are in grid form, you draw them and enlarge them yourself. The pattern ebook that I also received has some of the patterns enlarged and ready to print. 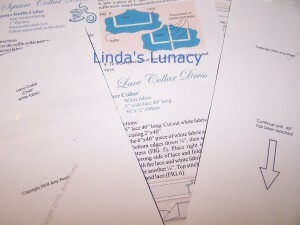 Some of the patterns do take several pages to print. 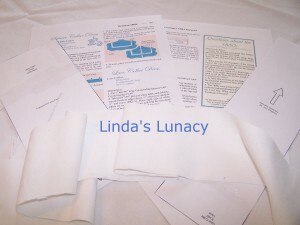 Each chapter has color instructions to make cuffs, aprons, bonnets, hats, collars, vests, etc. There are also lots of extra goodies like quotes, quizzes, and beautiful pictures. You will learn more about the history of the eras from reliable old sources. Hannah and I both liked all the historical information included. I had fun quizzing her with the quiz. lol This is a fun book for girls and ladies of all ages. Certainly a great book for mothers and daughters to read and sew together. I let Hannah, 16, go through the book and choose where she wanted to start. She chose the Victorian 1880 section. She really liked the lace collar and cuffs. I printed out the pages that she needed, and she got to work. She did all the work by herself. Hannah said the directions were easy to follow. The collar and cuffs were pretty simple to make. I printed the patterns from the pattern ebook onto legal size paper. In this picture you can see both sides of the collar. There is a casing down the middle of the underside that a ribbon is threaded through. It is then gathered and tied around the neck. Hannah made the collar and cuffs according to the pattern size. She didn’t downsize the pattern, and they fit Abby, 14, very nice. Hannah and I talked Abby into modeling for us. We already had this old fashioned dress that Hannah had made a few years ago. It now fits Abby perfectly. I just love the look of the collar. 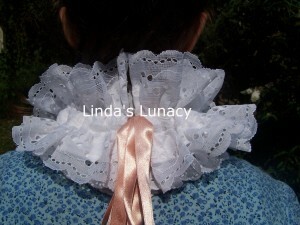 Here’s the back of the collar. You can see the ribbon that is used to gather and tie. We left the ribbon hanging out, but you could tuck it to the inside, also. The cuffs are great, too. The cuffs are made with a casing on the inside like the collar, only the cuffs use elastic instead of ribbon. Neither the cuffs or the collar are attached to the dress, making it easy to transform one dress into many costumes. I am impressed with the quality of the book and the patterns. Hannah liked the patterns and said she would use them in the future as the need arose. 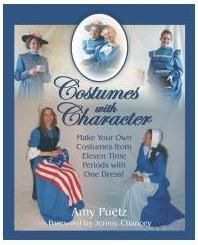 The Costumes with Character eBook sells for $21.95. On sale for $17.56 Also available as a printed book The pattern ebook in PDF form that I used is free with the purchase of the Costumes with Character eBook. You can also purchase printed patterns for $15. On Sale for $12. These prices are current at the time of this post. In the future, patterns that you can buy and cut (like store bought patterns) will be available. I will keep my eye open for these to be available, as they would be great to have. Cute! Thanks for sharing a photo of the outfit. It looks like she had fun with this one. My daughters enjoyed making the pioneer costume and just found lace for this one. I’m so glad that you shared pictures. That turned out very well! Thanks for sharing a picture!